The Bulls Sunday exited their cruelest month, this being January with the lilac relief of a 121-108 victory over the Philadelphia 76ers. The Bulls had seven players score in double figures led by Jimmy Butler with 28 points, eight rebounds and seven assists. Robin Lopez had 21 points and 10 rebounds and Doug McDermott and Dwyane Wade each had 14 points. Paul Zipser and Nikola Mirotic each had 13 points and Rajon Rondo had eight points and 10 assists. The Bulls had 29 assists and shot 50.6 percent. Ersan Ilyasova had 31 points for the 76ers. The Bulls were without Taj Gibson, who sat out with ankle soreness, which previously sidelined him a game. Bobby Portis got the surprise start after sitting out the last four games. Portis didn’t score early, but was aggressive on the boards and helped the Bulls dig out og an early 8-3 deficit with his hustle. It was Lopez doing the scoring early as the 76ers collapsed on Butler off the pick and roll, leaving Lopez open for jumpers. He was four of six in the first quarter with a pair of blocks. Butler and Wade still were struggling, combining to miss six of their first eight shots. But with Butler getting to the free throw line, and then Mirotic with a three and steal and running dunk shot and then Rajon Rondo with an amazing inbounds full court pass for a Mirotic goaltending, the Bulls ended the first quarter on a 13-0 run for a 37-23 first quarter lead. McDermott with a jumper and a three early in the second quarter helped close off a 20-2 Bulls run that enabled the Bulls to take a 45-25 lead. 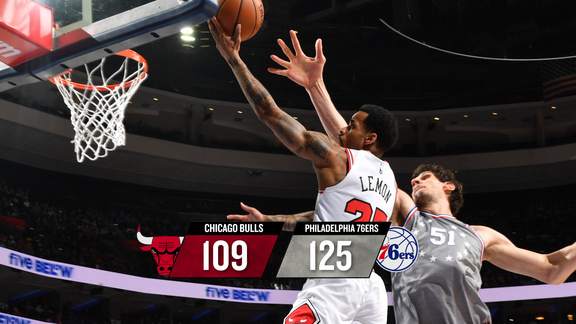 The 76ers rallied back with back to back Robert Covington threes and an unusual five-point play when Covington rebounded a missed free throw between two Bulls and finished off his own three-point play after an Ersan Illyasova attempt at a three-point play. That got the 76ers within 54-45. 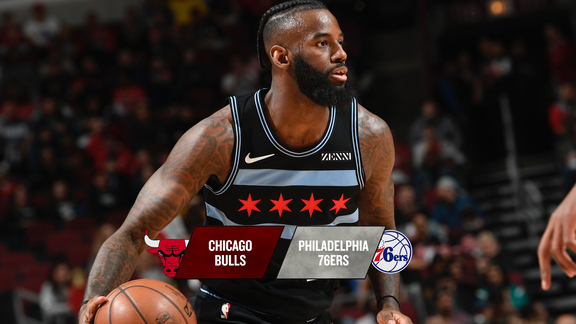 Both Mirotic and McDermott were in double figures in the first half, but with Ilyasova scoring 21 in the first half, the 76ers pulled within six points before the Bulls closed the half leading 67-57 with four players scoring in double figures led by Lopez’ 15. It was a Bulls season high in points at the half. The Bulls had 17 first half assists, six from Rondo. Portis contributed a pair of early second half jumpers as the Bulls maintained, taking a 77-66 lead four minutes into the half. But yet another missed free throw rebound by the Bulls gave the 76ers the vigor to get within 77-71 with 6:15 left in the third quarter. The 76ers kept coming with the wily play of tiny T.J. McConnell to tie the game at 79. Butler then exerted himself with a hard drive and then a steal and dunk and the Bulls dribbled into the fourth quarter leading 96-87. Rondo had a big start to the fourth quarter with a tie up on a 76ers drive, a driving layup and three for a 101-87 Bulls lead. But the 76ers continued to beat the Bulls to loose balls and second chances on missed free throws and stayed within 104-97 with 5:37 left in the game. Butler and Wade then extended the Bulls lead with Butler at the free throw line and Wade with clutch shooting.